We specializing in Nickel or “Show” Chrome, it is generally used for bumpers and automotive brightwork but the possibilities are endless. 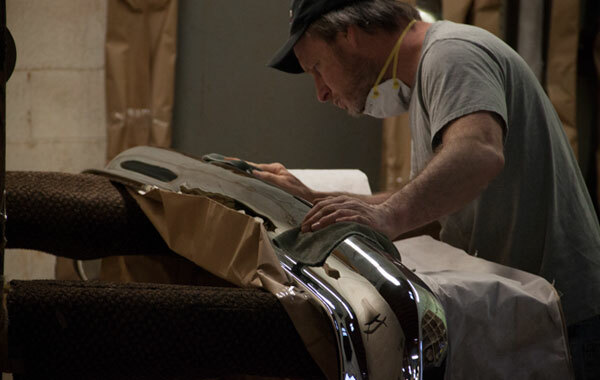 Pot metal, also known as die casting or white metal, allows us to restore hood ornaments, door handles, grills, window lifts, dashboard trims, and more. Extensive inventory of plastic bumpers & more. Do you run a body shop? Insurance companies love us. Contact us for more details. We take great pride in repairing and restoring your part(s). Our lead expert, George, has been developing his craft for over 35 years. 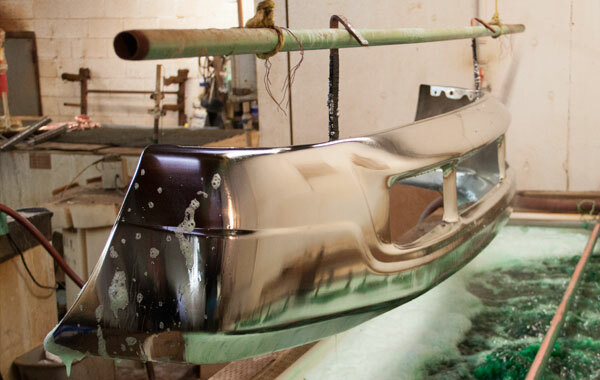 Rest assured, whatever it is you’re chroming, it’s in the hands of the best in the business. We are proud of our chroming process and all of the work involved. Each step is performed with the utmost care because we believe your part is irreplaceable. Our process creates incredible results to make your items look new again. No two parts are alike, so we handle each item that comes through our shop with the individual attention we’d give to any part on one of our own projects. We begin by stripping your part down to the bare metal. Plating over old material can cause premature chroming failure. Rust and old materials including chrome, nickel, and copper are removed entirely. Our experts use speciality tools to hammer out small dents and a hydraulic press to remove large dents and straighten frames. Grinding is then performed to remove pits and imperfections. Cracks and holes are filled using various high-quality metals. Polishing is performed to prepare your part for plating using a series of grit disc. This removes most remaining imperfections without damaging the metal. We use cyanide copper as a base to fill in any areas not yet straightened or repaired at this point. The cyanide copper also helps adhesion of the nickel and chrome in the next steps. We apply multiple coats of acid copper plating to fill imperfections and build up your part for sanding and blocking, similar to priming before painting. Your part is sanded and polished in between coats to ensure the next steps are successful. Your part is buffed to a mirror finish and then nickel-plated. If there are any remaining imperfections, your part is re-polished or nickel-buffed and then nickel plated again. Your part is plated in hexavalent chrome. If there are any remaining imperfections, the chrome is stripped and your part is nickel-buffed, nickel-plated again, and then finished with a chrome plating. Before cleaning and wrapping for transportation, we carefully inspect your part to ensure there are no remaining imperfections or damage and that your part looks better than new. Note: Please have bolts welded in from the back side before sending your part to us. 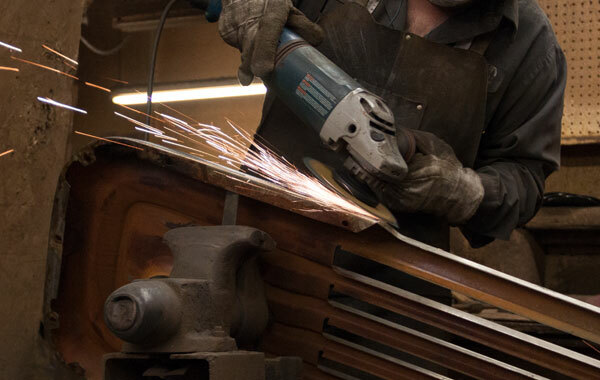 If your part needs to be welded on the front, please leave that to our experts. If you do weld the front, please leave the bead for us to grind down.